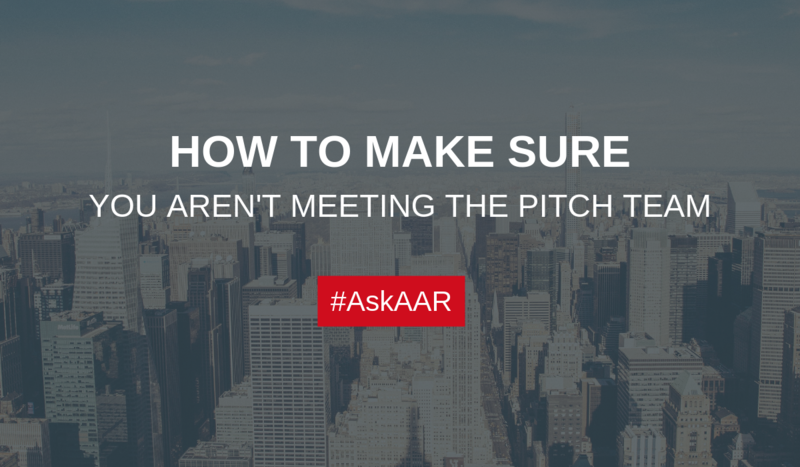 How To Make Sure You’re Not Meeting The Pitch Team from AAR Partners on Vimeo. This question is an age-old question that often leads to lots of discussion on both sides. Here’s the bottom line, you’re not going to be able to meet every single person that is going to be running the account on a daily basis at the agency, but you should absolutely be meeting the executive or management team responsible for managing the business. Here’s the thing, agencies don’t know your business yet so it’s quite difficult to staff the day to day team appropriately from the onset. Agencies also don’t have “spare” people sitting around the office waiting for the next new account to land in their lap. Overhead is high enough without keeping a lean and mean team. Request to meet the senior team responsible for managing the account, so you have a good sense of the folks ultimately managing the day to day team. Request to meet the lead account person who will be a key player on the account day to day. Ask for the percentage of time each team member you’re meeting will be assigned on your account. Ask for a pitch team warranty in your agreement. In other words, if any member of the team you’re meeting shifts off the account for reasons other than leaving the agency, then you want some kind of reimbursement. You should not be meeting the “pitch team” but keep in mind that it’s not always realistic to be able to meet the entire team who will run the account on a day-to-day basis either.